In this tutorial we will learn how to create an accordion menu in pure CSS3. As we will create it with CSS this will only work on browsers and devices that support the :target pseudo-class selector. Create an unordered list with an anchor tag and a span tag. Add a different id for each list item and link to this id with the anchor tag. To be able to style and open the accordion when we click on it we need to use the :target selector. The target selector will only work if we will have a link that points to an id and when we click on that link the id becomes the target element. And with this way we are able to make the sub menu links visible. First of all we’ll add some reset styles to the menu to clear the margins, paddings, etc. Now let’s style the menu links. We will add a CSS3 gradient, some shadows and more basic styles for font, etc. The menu will not have a fixed width. It will take the entire width of his parent, so if you want to give it a 300px width just create a div and give it the width that you want. In order to prevent layout issues we will give it a minimum width of 160px (110px width + 50px padding). 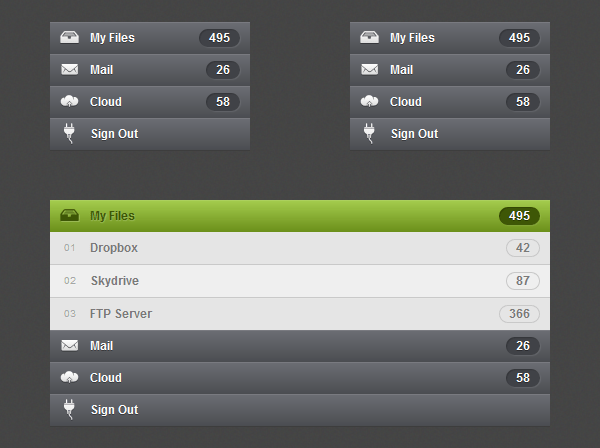 To style the span that will contain some numbers we’ll give a gray background color, some shadows and rounded corners. To insert the icons we will use the :before selector, this selector inserts content before the selected element. So this way we are able to insert the icons and position theme. The icons images that we will use have 24px width and 24px height. So we’ll position them on top left and add some margins to center the icons properly. I’ve created a sprite image that contains all the icons (normal and hover state). The advantage of using sprites is that we are able to load all the icons at the same time (fewer requests) and as we only have one image that contain all icons the size will be inferior. If you want to learn more about image sprites I recommend you to read this. To create the sub menus add another unordered list with the class of sub-menu inside of the list item that you want to have sub menus. The styles of the sub menu links are almost the same. We’ll only change the colors, shadows, etc. We also have added an “em” tag that will contain some enumeration. For the hover and the current active link state we will change the gradient to a green one and also change the styles of the “span” to green. As in Futurico UI this accordion uses a pattern I have added it. You can choose if you want to use the pattern or the CSS3 green gradient. For the sub menu hover state only change the background color to a brighter one. We’ll give 0px height to the sub menu to hide it and also add a transition slide effect. In order to make the slide transition work we need to give a fixed height to the sub menu. So if you want to add a different number of links to each sub menu you need to add a different height to each sub menu according to how many links you have. As I only have three links I use 98px height, if you want to make it automatic add a 100% height value but the slide effect will not work. We have finished this Pure CSS3 Accordion Menu. Hope you like it and don’t forget to live some feedback or any question you have in the comments. The selected menu item jumps to the top of the window because you use the pseudo-element “:: target”. We could use that but in my onion it’s not the best option. but it’s using anchors and in a real page, not a preview, each time we click on an item, the page “move” to menu clicked and it’s very annoying. I personnaly prefer the accordion menu using checkboxes or radio rather than href. Whatever, thank you for this tutorial. I know, we already posted a jQuery version :D.
I have one little problem though; when I use the buttons the whole page jumps so the first li is in the top of the browser window. can anybody help me stop the sub menus from collapsing when its active. I tried commenting out the tranisition effects in the css but doesnot work submenus with links(only works submenus without links.). I need help ASAP. Please help me out. Am I correct in thinking that this menu concept isn’t going to work for me? Question, how do you keep the window pane open when a link is selected, rather then having the selected area close as soon as the mouse stops hovering over the selected link? Great – Which license ist that? Can i use the icons and the code on my page (not commercial)? Yes you can, download archive with license. Thank’s for the great tip. I have tried to build my own accordion menu following your tutorial. Hi. This tutorial is great. I have adapted the design to my needs and it works perfectly. Thank you!! I just have one question left: is there a way to add a sub-menu to the sub-menu? I added one more unordered list and styled it. But the animation doesn’t work like i would like to. Ideally the second sub-menu list should expand only when i hover it’s parent in the first sub-menu… Any idea how to achieve that? I am facing a problem, if we have not a sub menu a want to give a hyper link on the main menu then how do it. please help me. I am trying to have variable height submenus. Help! I have tried max and min height and neiher works. why is it that my sub menu is not hiding? Help! I cannot get the sub menus to hide. They just stay open all the time. How is this accomplished? Everything else works & looks great though. Thanks for this tutorial! I am having the same problem with the submenus constantly open. I thank you in advance for any advise. Awesome example, thanks for sharing! Is there a way to extend this example to allow for 3 levels? I’d very much like to use this menu example, but I can’t figure out how to add a third menu. Any help would be greatly appreciated! Excellent CSS menu, thanks for sharing. changing the height to auto allows unlimited submenus. How about “sub-sub-menu” and “sub-sub-sub-menu” and so on? And my body’s height is over 4000px, is that possible to stop scrolling to #three? What should I do when there’s more than 3 sub-menu elements in the menu? It’s ok to use 98px for any 3 itemed menu but if the menu has more than 3 items, 4th and other items doesn’t show. Is there a way to expand the menu according to the sub-menu items inside it? One more question: How can i add a third level? Thanks for this menu but one question for me, is it full compatible with IE ? If not, what are we need to modify for it ? This is a really great tutorial, i have been looking for a slick accordion style solution i can use in my project, and this looks impressive. Is it possible to make the menu items open and close on Mouse Hover ? Currently, you have to click on the menu item for it to open, can this be done using Mouse Hover ?? Thank you, and thank you for a great solution, i have also seen alot more of your other items and products, really stunning work. I look forward to using you again in the near future. Good and simple design. It helped me lot. Very very good one. Just one thing. How can I make this responsive so that he can adapt to any device if I shrink the window? Thanks for the tutorial. It obviously works well, and it’s exactly what I’m looking for, but I’m a coding beginner (ish) and I’m not able to get it to work. I’m unclear where to paste all of this code. I’ve read about externally linking the html code to the css code which I think I’ve got figured out, but when I publish- I’m not seeing any of the css properties for the menu. Any help on where to go to search for it? Hi, thanks for the tutorial, my only question is what I can do if I want to have a different number of items under each sub menu. In one I have 3 items but in another I have 7, is there any way to make this work without making several different classes of sub-menus? Thanks! 1. Click to Close the accordion. 2. Multiple independent “Groups” of accordions where there is no interaction between groups of different name. id love to have some advice on how it can be done without JS if possible. hi. i tried but the sub menu doesn’t hide at all….how to fix this? i am using chrome btw. You can prevent the accordion ‘jumping’ when selected by adding the following CSS. It inserts a psuedo element to increase the height of the anchor above the top of the page, so the browser has no where to jump to.